Imagine your steak tacos get a serious upgrade- and that’s what's happening in this dish. 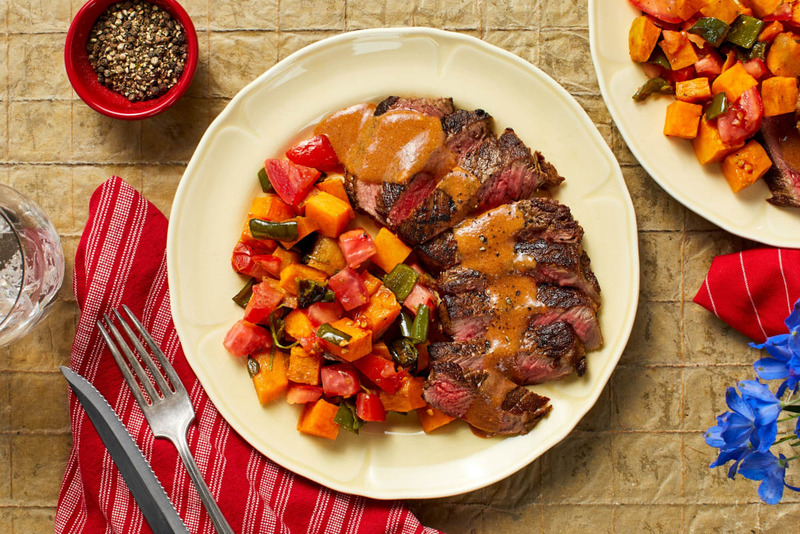 Your steak is transformed with this southwest pan sauce. It’s made by adding layers of flavors and spices like chili pepper and cumin with tangy tomato and smooth sour cream. Then roasted sweet potatoes and peppers get mixed with fresh tomato and zesty lime to serve with the steak. The end result is an elevated take on Tex-Mex. Adjust rack to middle position and preheat oven to 425 degrees. Wash and dry all produce. 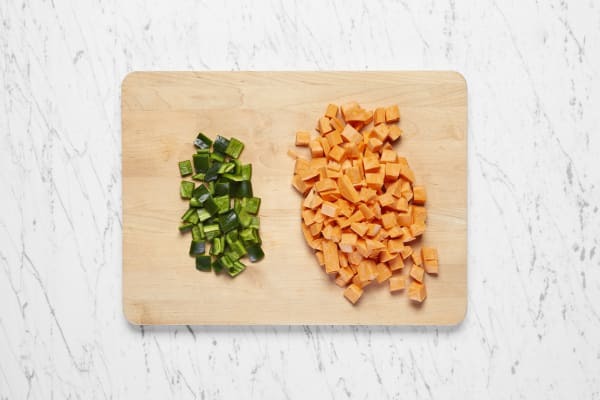 Peel and dice sweet potatoes into ½-inch cubes. Core, deseed, and dice poblano into ½-inch squares. 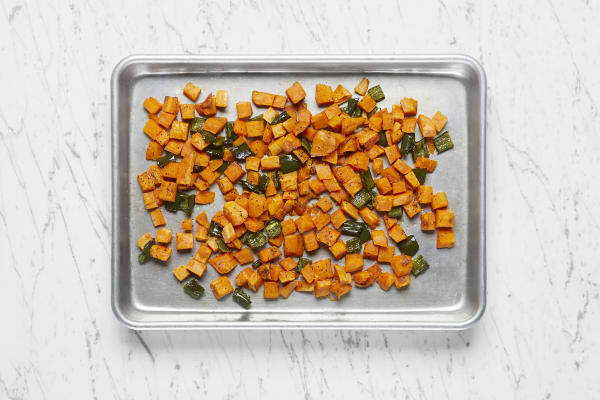 Toss sweet potatoes and poblano on a baking sheet with a drizzle of oil and a large pinch of salt and pepper. Roast, tossing halfway through, until lightly browned and tender, 25-30 minutes. Meanwhile, zest lime until you have ½ tsp zest; quarter lime. Finely chop tomato. Heat a drizzle of oil in a large pan over medium-high heat. Pat steak dry with paper towels, then season all over with salt and pepper. Add to pan and cook to desired doneness, 3-6 minutes per side. Remove from pan and set aside to rest for at least 5 minutes. Allow pan to cool slightly. 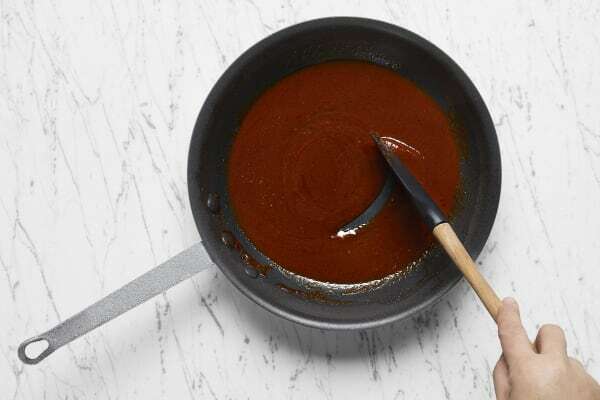 Bring pan to medium heat and add Southwest Spice and half the tomato paste (save rest for another use); stir constantly for 30 seconds. Stir in stock concentrate, half the hot sauce (start there and add more to taste), and ⅓ cup water. Bring to a simmer, then remove from heat. Stir in sour cream and 1 TBSP butter; season with salt and pepper. 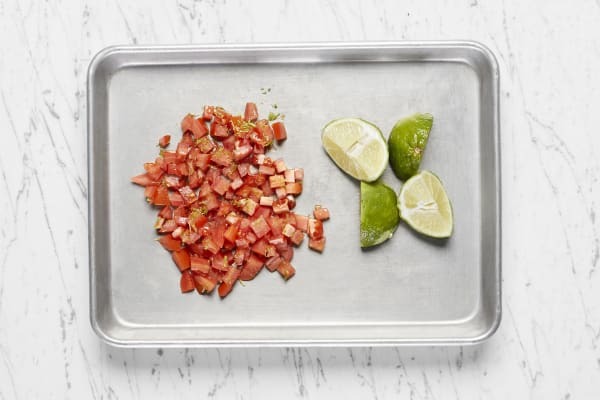 In a medium bowl, combine roasted veggies, tomato, lime zest, a squeeze of lime juice, salt, and pepper. 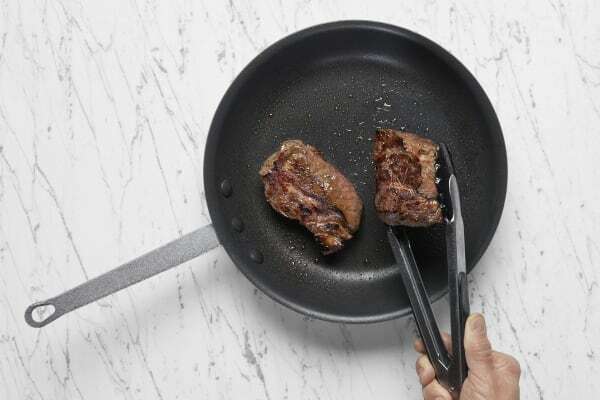 Thinly slice steak against the grain. Divide veggie jumble and steak between plates. 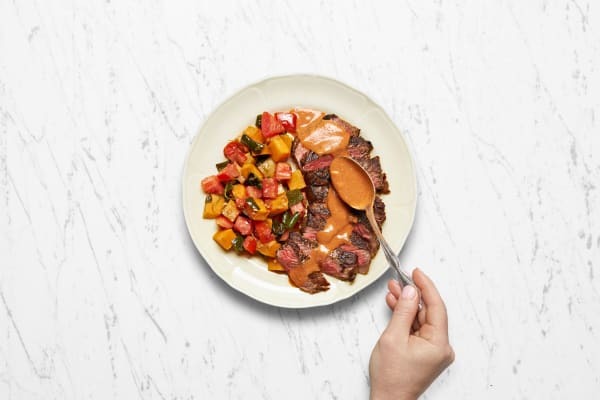 Spoon sauce over steak. Serve remaining lime wedges on the side for squeezing over.